An explanation and apology can help mend a company's reputation. Bank of America (NYSE:BAC) made mistakes in the lead-up to the financial crisis, but those mistakes don't explain the fact that the nation's second-biggest bank by assets continues to get horrible customer service scores. To fix these, the $2.15 trillion bank should take a page out of Chipotle Mexican Grill's (NYSE:CMG) response to its recent E. coli outbreak in Washington and Oregon. In the latest customer satisfaction survey from J.D. Power, Bank of America scored last in three out of the four geographic regions compared to the likes of JPMorgan Chase (NYSE:JPM) and Wells Fargo (NYSE:WFC). It produced a middle-of-the-pack score only in the Midwest. Source: J.D. Power's 2015 U.S. Small Business Banking Survey. Chart by author. Is Bank of America really this bad when it comes to customer service, or is something else going on here? I believe the answer is the latter. From my experience as both a financial writer and longtime Bank of America customer, I can't help but conclude that the Charlotte, North Carolina-based bank isn't as bad as it's made out to be. There's no question it's incurred more legal claims from the financial crisis than any other bank. But the cumulative $195 billion price tag has less to do with its own imprudent, predatory lending and more to do with the not-so-borderline conduct that occurred at Countrywide Financial prior to its acquisition by Bank of America in 2008. The reputational and financial damage that Bank of America suffered as a result of this acquisition has haunted it ever since. This is despite the fact that it seems to have halted many, if not all, of Countrywide Financial's most egregious practices. The ongoing problem, in turn, is this: While Bank of America has simplified and streamlined its operations, structuring them around the bank's core customer groups, it has yet to tackle the lingering reputational harm with an appropriately themed marketing campaign. Bank of America's current ad campaign comes up woefully short. It tracks the bank's role in its customers' lives, from one generation or activity to the next. One ad shows people using their Bank of America debit cards at restaurants and shops, a man and his sons leaving a Bank of America branch, and a young woman using the bank's mobile app to deposit a check while on a bus. This is good and fine, but it doesn't address the bank's main problem -- namely, that it's become the poster child of the anti-consumer practices that led up to the worst economic cataclysm since the Great Depression. This is the white elephant in the background of every Bank of America television commercial -- figuratively speaking. And instead of sticking its head in the sand and hoping it will one day go away, Bank of America needs to address this head on. I've been reminded of this as I've watched Chipotle Mexican Grill manage through allegations of E. coli poisoning in Washington and Oregon, my home state. Chipotle hasn't clammed up and refused to take responsibility, as Bank of America has over the past few years. It's chosen instead to confront the problem with as much transparency and humility as possible from a company that's already facing legal claims from alleged victims. This letter posted to Chipotle's website provides a case in point. It starts by informing readers about the E. coli problem. It then goes into the steps Chipotle is taking to fix the issue. It then promises in legally admissible writing that the company will "take care of those individuals [affected by the alleged outbreak] and make it right." This response echoes that of Domino's Pizza's (NYSE:DPZ) circa 2009 marketing campaign in which it admitted its pizza crust tasted like cardboard. 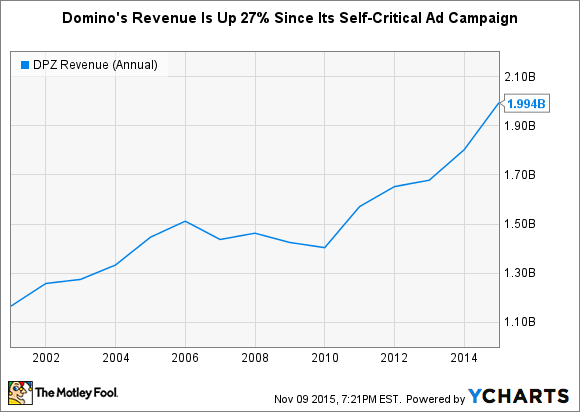 Domino's has since fixed the problem and soared on the back of an improved product, with revenue climbing by 27% since the beginning of 2010 alone. The counterargument, of course, is that Bank of America can't admit fault or responsibility because doing so would expose it to too much legal risk. But the statute of limitations has already closed the door on most of the bank's crisis-related legal opponents. In the second quarter of this year, a judge's holding allowed Bank of America to go so far as to reduce its most vexing outstanding legal liabilities by $7.6 billion. The time is finally right, in other words, for Bank of America to address its reputational damage as directly as it attacked expenses and its once unwieldy balance sheet. There will be a downside to a public admission and apology, as litigants cite the bank's statements against it, but it's hard to think that the upside, in terms of a desperately needed revenue boost, won't more than make up the difference.